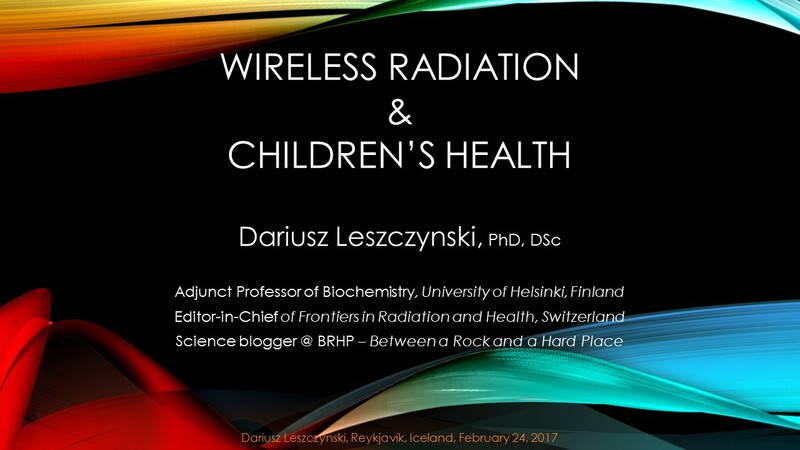 This entry was posted in Mobile phones and health and tagged BioInitiative, carcinogenicity, cell phone, children, compliance with safety standards, dangerous, Dariusz Leszczynski, echo chamber, EHC, EHT, Environmental Health Criteria, Environmental Health Trust, GSMA, IARC, ICEMS, ICES, ICNIRP, MMF, Mobile Manufacturers Forum, mobile phone, not dangerous, precaution, precautionary approach, reliability of safety standards, schools, the Precautionary Principle, The Round-Table Initiative, WHO, WHO EMF Project, wi-fi, wired internet, wireless internet by dariuszleszczynski. Bookmark the permalink. Thank you for sharing great information that everyone needs to be aware of. I highly recommend the book ‘Overpowered’ by Dr Martin Blank, who covers biological damage to DNA fully, as well as the whole spectrum of radiation, including electromagnetic fields and electric fields with their negative interaction with humans, plants and animals. A must read to be more fully informed. We have a power utility wanting to put through a 132kV high voltage transmission line within 50 metres of several homes on our farm, over a large stable complex housing many horses, and destroying half a kilometre of riparian vegetation along a large creek housing platypus. We have acquired a lot of knowledge over the last 7 years as to the dangers of the above and attempting to make the authorities accountable, but denial of serious adverse health effects is their motto. Now they have informed us that they are planning construction in the very near future. Thank you very much for publishing all this information. I am a person without any knowledge in your area of expertise – nevertheless, I found your presentation enlightening. Regardless of statutory regulations in my country (Poland), I will try to apply both the Precautionary Principle and the ALARA principle on an everyday basis. Thank you again for your work. All the best! P.S. Najserdeczniejsze pozdrowienia z Polski! This is the best summary of the state of the art in mobile communications and public health. You are correct about the ICNIRP origination and status. Unfortunately, many authors take their statements as standards.